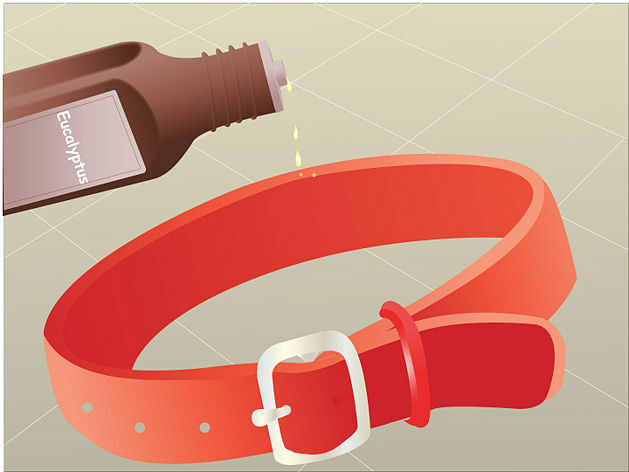 Take the pet's collar or neckerchief and put on drops of Eucalyptus oil, tea tree oil , citronella, lavender, or geranium. This will need to be done weekly. Note: Do not use essential oils on cats! While cats are extremely sensitive to Eucalyptus and tea tree oils, a cat's ability to metabolize any essential oils inhaled, ingested or absorbed through skin is considered to be weak and there is always a risk of overloading a cat's system. With tea tree oil, be especially careful to use products with 1% or less of this essential oil. It can cause nausea, vomiting, lethargy and general weakness, and should be used with caution. With this oil, more is not better.